Exposure to fine particulate matter (PM2.5) increased the risks of cardiovascular diseases. PM2.5-bound 1-nitropyrene (1-NP) and 9-nitroanthracene (9-NA) are released from the incomplete combustion of fossil fuels and derived from polycyclic aromatic hydrocarbons (PAHs). The toxicities of 1-NP and 9-NA are mainly reflected in their carcinogenicity and mutagenicity. 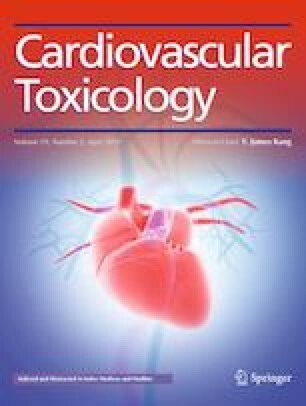 However, studies of PM2.5-bound 1-NP and 9-NA on the cardiac genotoxicity are limited so far. In this study, histopathology, DNA damage, DNA repair-related gene expression, and oxidative stress were investigated in the hearts of male Wistar rats exposed to PM2.5 [1.5 mg/kg body weight (b.w.)] or three different dosages of 1-NP (1.0 × 10− 5, 4.0 × 10− 5, and 1.6 × 10− 4 mg/kg b.w.) or 9-NA (1.3 × 10− 5, 4.0 × 10− 5, and 1.2 × 10− 4 mg/kg b.w.). The results revealed that (1) PM2.5, higher dosages of 1-NP (4.0 × 10− 5 and 1.6 × 10− 4 mg/kg b.w.) and 9-NA (4.0 × 10− 5 and 1.2 × 10− 4 mg/kg b.w.) caused obvious pathological responses and DNA damage (DNA strand breaks, 8-OHdG formation and DNA–protein cross-link), accompanied by increasing OGG1 and GADD153 expression while inhibiting MTH1 and XRCC1 expression in rat hearts. Also, they elevated the hemeoxygenase-1 (HO-1), glutathione S-transferase (GST), and malondialdehyde (MDA) levels and decreased superoxide dismutase (SOD) activity compared with the control. (2) The lowest dosages 1-NP or 9-NA could not cause DNA damage and oxidative stress. (3) At the approximately equivalent dose level, PM2.5-induced DNA damage effects were more obvious than 1-NP or 9-NA along with positive correlation. Taken together, heart DNA damage caused by PM2.5, 1-NP and 9-NA may be mediated partially through influencing the DNA repair capacity and causing oxidative stress, and such negative effects might be related to the genotoxicity PM2.5, 1-NP, and 9-NA. This research was supported by the National Natural Science Foundation of China (No. 91543202) and the Nature Science Foundation of Shanxi Province in China (No. 2014011036-2).